Wheelchair basketballer Amber Merritt, diver Nikita Hains and kayaker Stephen Bird. 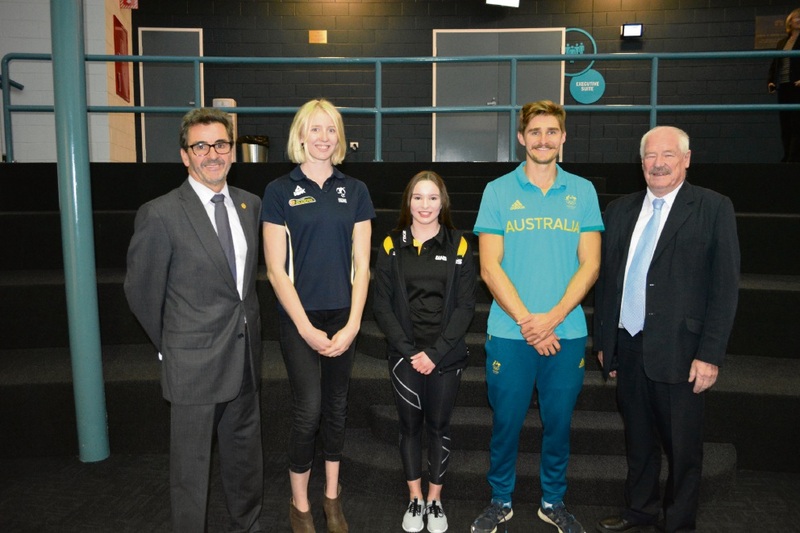 VenuesWest chairman Richard Muirhead, wheelchair basketballer Amber Merritt, diver Nikita Hains, kayaker Stephen Bird and Sport and Recreation Minister Mick Murray. 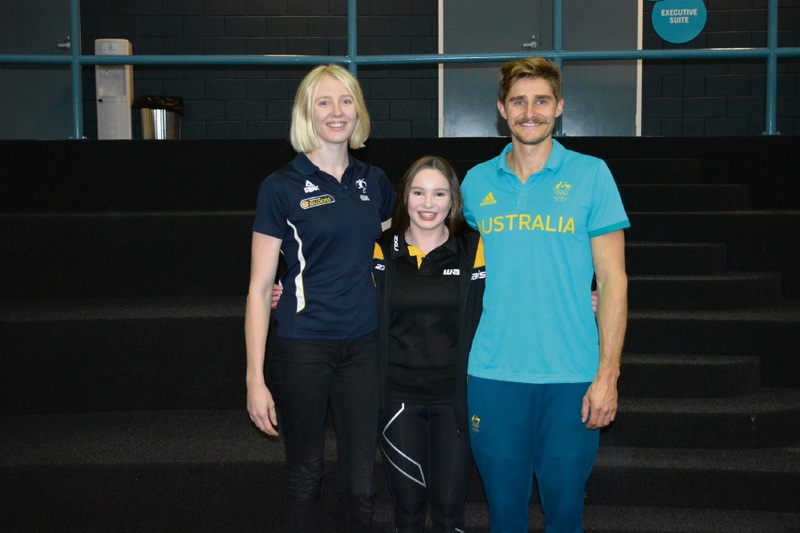 FOUR of WA’s best athletes were named as VenuesWest brand ambassadors on July 3, which will help their quest to qualify for the 2020 Tokyo Olympic and Paralympic games and 2018 Commonwealth Games. Dual Olympic kayaker Stephen Bird, 2012 London Paralympic Games basketball silver medallist Amber Merritt, national diver Nikita Hains and 2016 Rio Olympic Games butterfly swimmer Brianna Throssell received $5000 to assist with training and competition expenses. The cheques were part of the State Government and VenuesWest’s Brand Ambassador Program. Each athlete train at Champion Lakes Regatta Centre, HBF Stadium and Bendat Basketball Centre respectively. Sport and Recreation Minister Mick Murray and VenuesWest chairman Richard Muirhead presented the cheques at an event at HBF Stadium. Dianella resident Hains, who is striving towards the 2018 Commonwealth Games, said she was grateful to have become an ambassador. Bird, who also trains at Bayswater Paddlesports Club and is a member of Canning River Canoe Club, said he was working towards his last Olympics in Tokyo, after finishing eighth in the K1200m in Rio. “It is a great opportunity to engage with community and young people as well as stakeholders involved like VenuesWest,” he said. “This is an opportunity to train more professionally. “I believe if I can do the right training, enjoy it and keep stimulated, in Tokyo, there is no reason why I can’t go for a medal. Merrit said the Australian team would be playing world championship qualifiers against Japan and China in October, which will help them prepare for Olympic qualification. “Unfortunately, our program here in Australia did not qualify for Rio in 2016,” she said. “A lot of the girls had a bit of fire in their bellies. Mr Murray said he hoped young and aspiring athletes could look up to the ambassadors for inspiration and encouragement towards their own sporting goals.